I thought I would pop in here and show you our St. Patrick's day breakfast we had this weekend. I took my heart shaped waffle iron and dyed the batter green, then formed them in to four leaf clovers with a tasty sausage stem. Turned out pretty cute and nummy. The girls seemed to like it, not to mention we served it with the "required" the green milk. Also we had quite a lot of fun making those shamrock sun catchers I posted about in my last blog, an idea from the blog Serving Pink Lemonade. 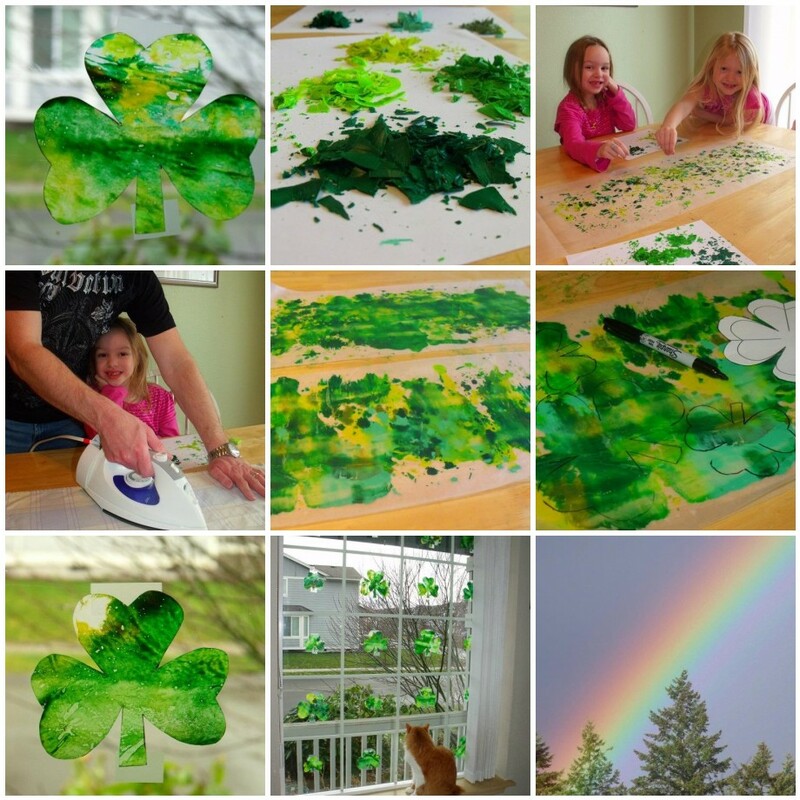 Shaving the crayons, finding different colors of green, daddy helping us with the iron part, tracing and cutting out the shamrocks. It was a fun craft for the whole family. We decided to tape them to our front window instead of hang them, but as luck would have it, we made 20 shamrocks only to find out our front window had spaces for 20 shamrocks. It was perfect. Or should I say "purfect" because our kitty Haley sat on the window ledge and admired them for some of the day. Then we got an extra beautiful surprise, as we were treated to a rainbow, (actually a double rainbow) which we thought was extra lucky on St. Patrick's day. Does that mean there are two pots of gold? Hooray!